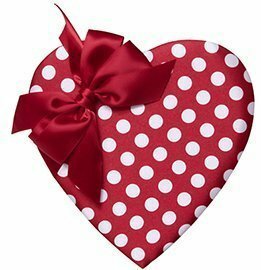 Polka Dot Heart, Assorted Chocolates – Chocolates by Leopold, Inc. So very elegant — white polka dots on red satin tied with a beautiful ribbon. All holding Leo’s scrumptious chocolates.